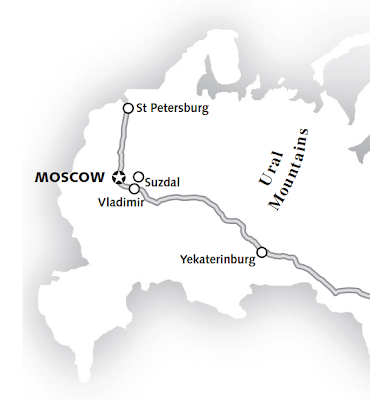 There are between 14 and 19 daily non-stop flights from Yekaterinburg to Moscow. For about $150 and 2 hours of your time you can travel on such esteemed carriers as Kuban Airlines, Transareo Airlines, Ural Airlines, and of course, Aeroflot. But why fly, when, for about $120 more you could take a 24 hour train ride? Our thoughts exactly. Having already logged thousands of miles in the comfortable 2nd class kupe compartments we felt it time to shed our bourgeois attitude and travel with the people. With only a few hours of emailing and then wandering around the Yekaterinburg train station looking for the single ticket window that could cancel and re-issue tickets we successfully downgraded our 2nd class tickets to 3rd class platskartny (platskart) or an open carriage configuration. This way, instead of spending our time in a little cabin with new friends like Luba, we could spend our time in a large, undivided cabin with 58 friends like Luba. That's right, the platskart cabin consists of 60 beds without any walls, arranged in a four bed arrangement running from the windows towards the center of the car, and then two beds running along side the window. The decision to downgrade was partly financial, but also because we had met friends who had positive experiences riding platskart. They met friends, were offered lots of food and drink (we love food and drink) and generally had a fine old time. Plus, traveling third class would be an adventure. The journey began with a very thorough inspection of our tickets and passports. Given that we had exchanged our tickets with someone who did not speak a word of English there was definitely concern that we were about to be turned away. Once on the train, however, things were looking OK. Here you can see down the aisle. Our seats/beds are on the left. The table flips up and over and turns into the center portion of the lower bunk's bed. The upper bunk is filled with bedding. On the right side you can see the ends of the 4-zer beds/seats. whereas we each had a small chair. Once the train got moving, the party started. It seems we got on a "naturalist" platskart train. Clothing was definitely to be optional for large Russian men. Besides, why would you want to wear pants or a shirt if you are traveling on a public train? Here is J in our two-zer. You can see how the bottom of the table is the bottom of the bed. It is not clear why she is wearing a shirt or pants in this photo. Most of the ride she played cards with the other men in just her unders. Here is the top bunk. It was fine, but not much room to sit up. In fact, you couldn't really sit up because above the bunk was a luggage compartment. In the Kupe class the luggage was stored above the hallway, so the upper bunk had lots more headroom. You can see the feets of our across-the-aisle neighbors in the reflection. Here I am in the lower bunk. I could nearly lay flat, just had to keep my feet slightly elevated. I also had a privacy curtain, which I jerry-rigged out of my blanket. 1) get on or off the train, and 2) while doing so, bump into me as I tried to sleep. We also had a cute pup riding in our car with us. He just snuggled up with his owner in her bed. The Platskart bathroom was totally fine. Even had some air freshener. She was the loudest snorer I have ever heard. Ever. Breakfast in platskart? Just like all of our other train rides. After a day and a night on the train we arrived in Moscow's central station. We said goodbye to all the provodnitsas that waited outside each car where a car awaited us to whisk us to the luxurious National Hotel, a far cry from the 3rd class ride that got us there. 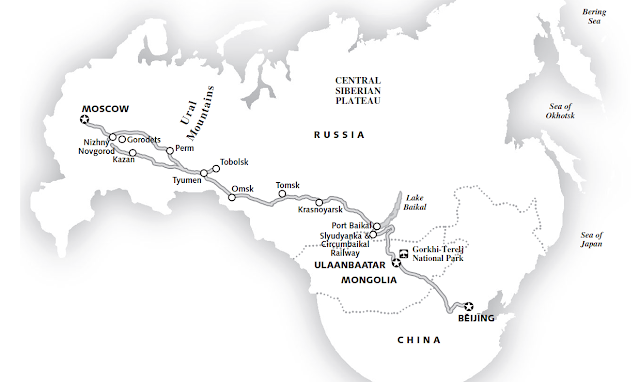 The train journey took us 7,865 kilometers (4,887 miles) over the course of one month. It was a great ride, with memories, good and bad, to last a lifetime. I will surely not travel 3rd class. Learn something new everyday. JDMesh 2010. All rights reserved. Ethereal theme. Powered by Blogger.